I've been extremely quiet on my YouTube Channel and my blog. No, I have not disappeared off the face of blogasphere. It's just that my Windows Movie Maker has been glitching. It's impossible to edit videos when all I heard are sounds. The preview doesn't show my the video itself. I hardly see how I can edit the videos. I actually have been dilligently filming. I have finished one Debika kit and is in the midst of finishing another. I have Kutsuwa Stamp kit clips, Whipple clips. I have even started fiddling with the resin I have purchased last year. I make a few would-be tutorials, on macaroons and fruits pieces as well as making cake rolls. I hope my WMM will behave itself. But in the mean time, I decided I shall start posting photos of the things I have done since my last updates. Usually, I would update with a video of the process. I guess from now on, the blog posts will appear first, as seeing how video editing is not possible in the near future. My lastest creation, miniature bread! 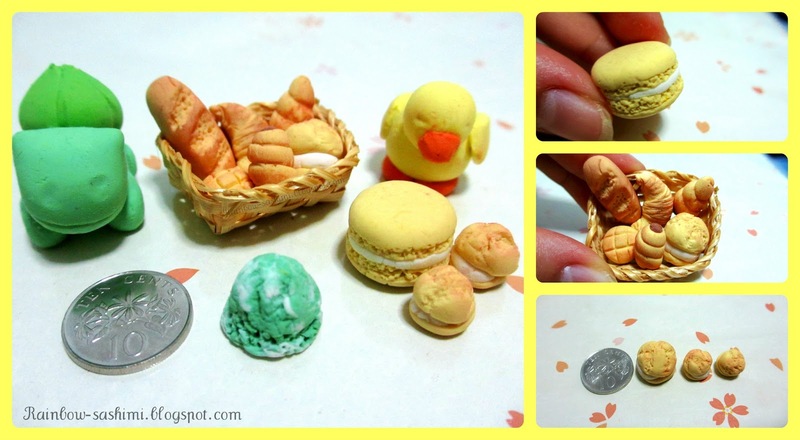 I made a small basket of bread, a Bulbasaur, a duck, a small icecream scoop with leftover clay, some cream puffs and a macaron. The basket contains a french loaf, a crossiant, a chocolate cornet, a melon pan, a hotdog bun and a cream puff (which isn't actually bread, but I didn't know what other bread I could make). The duck and Bulbasaur is incomplete. This was my first attempt in making bread. I must say it turned out ok. Pretty pleased with the results, even though I have much much more to improve on. The basket was from a Singapore-based shop. I will give a review on the shop soon.